Svaneti (Georgian: სვანეთი) is situated on the southern slopes of the Greater Caucasus mountains in the northwestern part of Georgia. It is the highest inhabited part of the Caucasus. 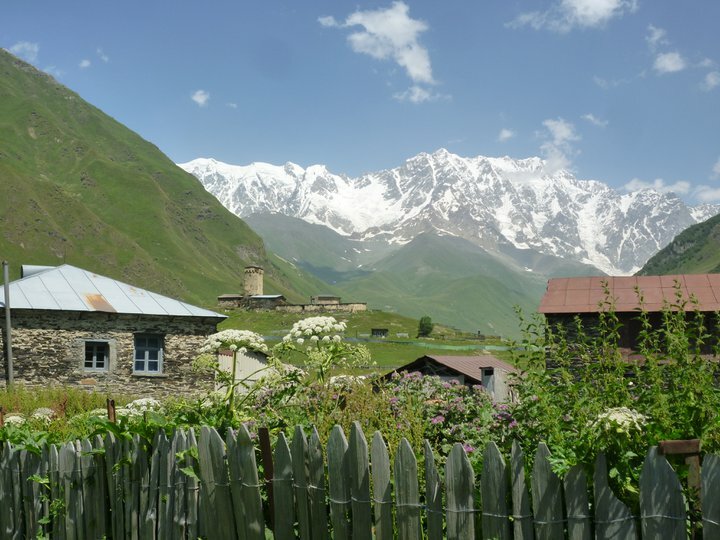 The characteristic landscape of Upper Svaneti is formed by small villages situated on the mountain slopes, with a natural environment of gorges and alpine valleys and a backdrop of snow-covered mountains. 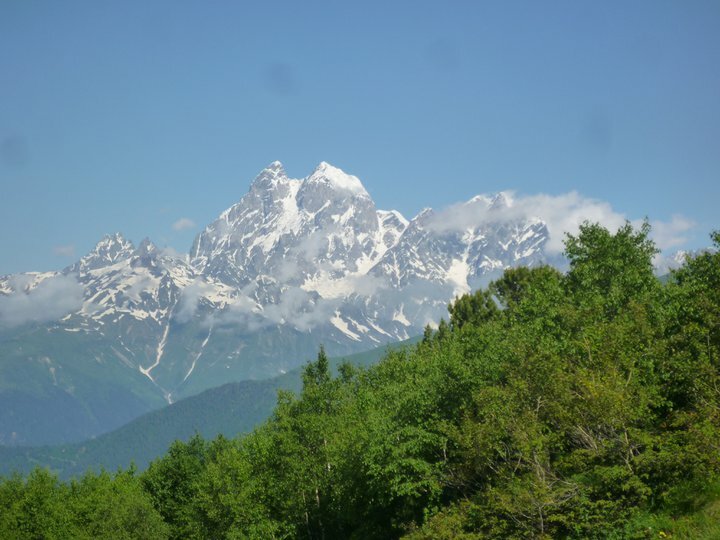 Svaneti is known for its wonderful scenery and its architectural treasures, including dozens of churches and the famous Svanetian towers erected mainly in the 9th-12th centuries. The towers were built as protection against invaders and raiders. 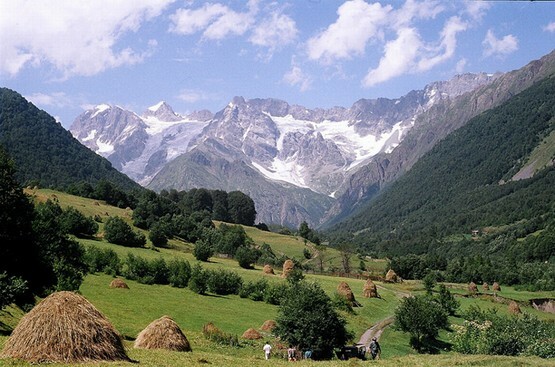 For many centuries the Svans (Georgian: სვანი) have been in contact with the northern Caucasian tribes on the other side of the mountains and with the Ossetians to the east. Though trading took place, these relations were often hostile, with raiding parties from one or the other group attempting to seize the other’s property. The towers also protected families during the blood-feuds that often took place in these communities. Instead of entrusting the defense of a village or town to a large fortress or castle, each Svan family built their own tower. The towers usually have from three to five storeys and the thickness of the walls decreases, giving the towers a slender, tapering profile. For protection, the entrance to a tower is some twelve feet above the ground, with a ladder or staircase below that could be destroyed in the event of an attack. Inside, large, flat rocks lay beside the ladder holes, ready to be employed as seals. 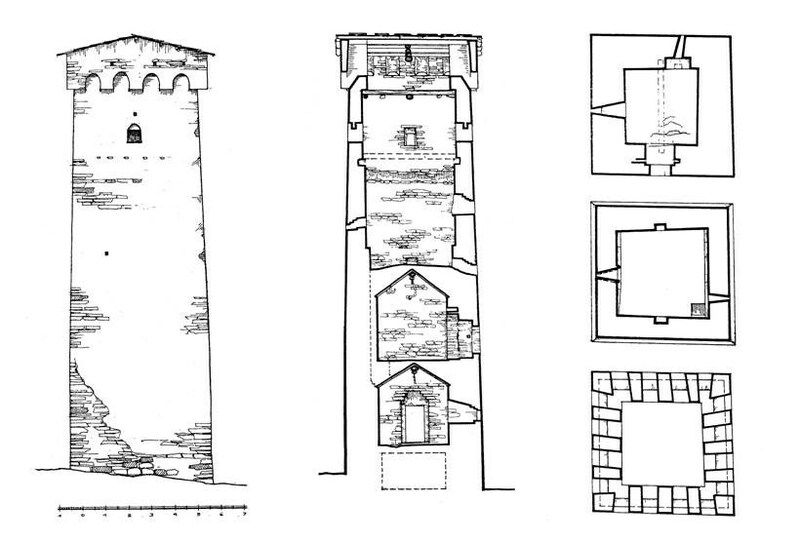 Drawing of a defensive tower of Chazhashi (ICOMOS Georgia Study funded by Getty Grants Foundation). Each tower is attached to a machubi, a big two-storey house. The ground floor is a single hall with an open hearth and accommodation for both people and domestic animals, the latter being separated by a wooden partition, which is often lavishly decorated. A corridor annex helped the thermal insulation of the building. The upper floor, called a darbazi, was used by the family in the summer, and also served as a store for fodder and tools. A door at this level provided access to the tower, which was also connected with the corridor that protected the entrance. 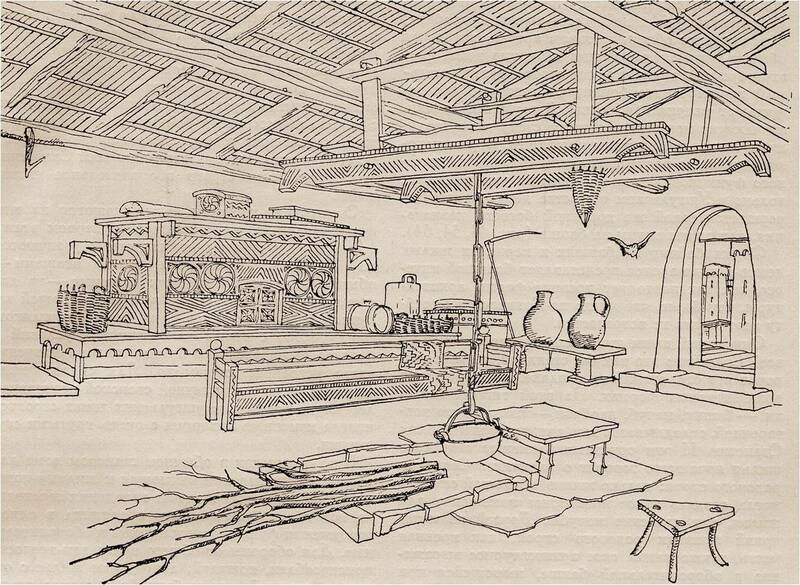 The house was heated by an open hearth in the centre of the hall, where food was also cooked. The residential unit was completed by a low boundary wall that enclosed an adjoining courtyard with stables and accessory structures. Sometimes families consisted of up to thirty or even a hundred members and huge residential compounds, with several towers, were constructed to accommodate them. Many of the tower-houses have disappeared or have collapsed into ruins over time. 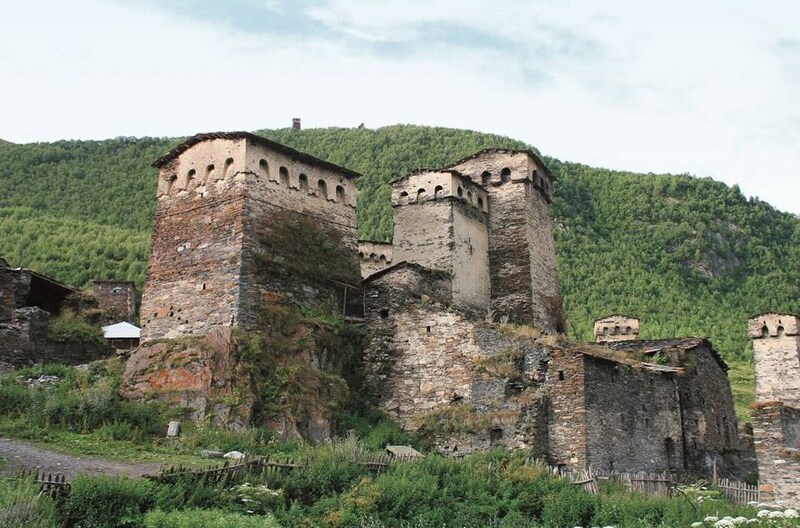 However, the village of Chazhashi (Georgian: ჩაჟაში), part of a group of villages collectively called Ushguli, located at the head of the Enguri gorge in Upper Svaneti has been preserved as a museum-reserve. Here more than 200 towers have survived. 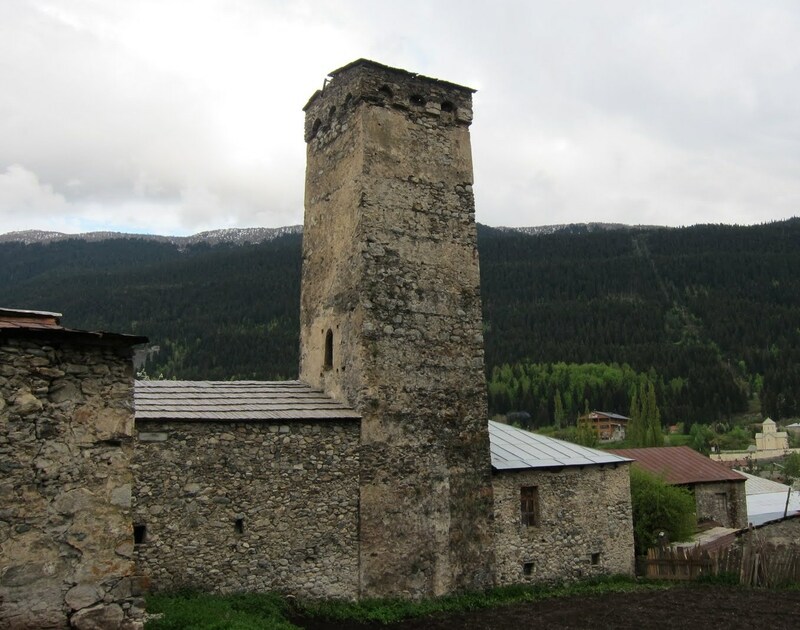 Other towers can be seen in Mestia and the frontier villages, such as Latali. Architectural monuments of Upper Svanetia are included in a list of UNESCO World Heritage Sites. By Air: Flights from Tbilisi (Natakhtari Airfield) to Queen Tamar Airport historic Mestia (Georgian: მესტია) are operated by Georgian airline Service Air three times a week – on Mondays, Wednesdays and Fridays. Flight time is 45 minutes (compared to a 7-8 hour road trip) and will cost 65 GEL one-way. By Train: From Tbilisi to Zugdidi by night train, then take a minibus from Zugdidi train station to Mestia. Duration 3-4 hours. By Bus: Tbilisi – Mestia mini buses go every day from “Vagzali” bus station. By Car: A new highway from Zugdidi to Mestia has been opened. With its breathtaking vistas of mountains, valleys, glaciers, forests and medieval fortified villages, Svaneti is a wonderful adventure and discovery! 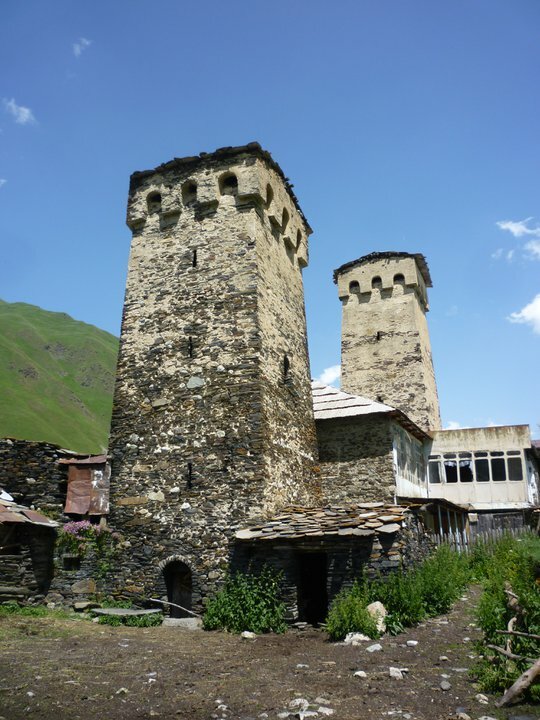 Georgia About recommends a trip to see the towers of Svaneti! What a beautiful place! I need to start a vacation fund! The mountains are so beautiful. The architecture in Georgia is just so stunning and what amazing history! It is like stepping back in time – absolutely amazing. Wow. This is fascinating! I want to visit Georgia! And I will only pack big, loose dresses so I can eat lots of khinkali!!! Those are so cool!!!! 🙂 Amazing! Thank you Chuck. I know you like history. You would love it! Gorgeous scenery… what a great place for a village and what fascinating architecture. 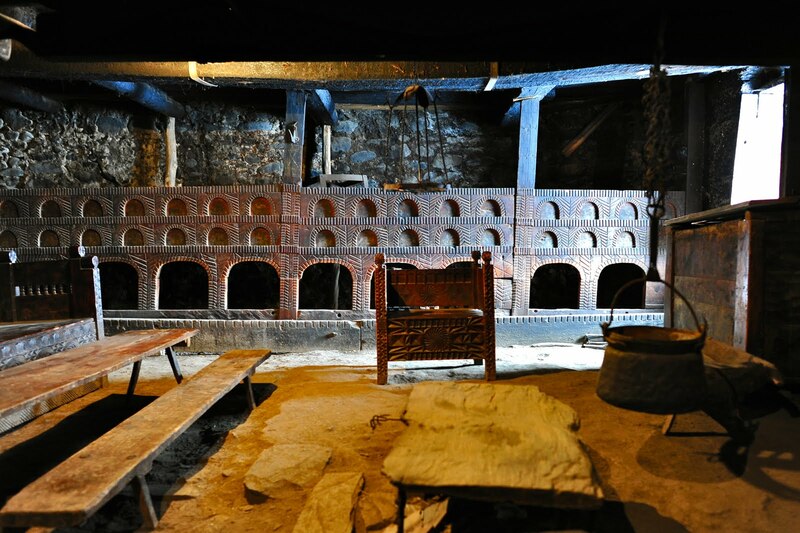 In the photo of the interior, is that a row of ovens all along the wall? I am very pleased you like it. The holes that you can see in the wall Shary are actually cattle stanchions. The animals stood on a lower floor, feeding from a trough along the ground. Georgia About is a fantastic blog about all things Georgian, I highly recommend it. 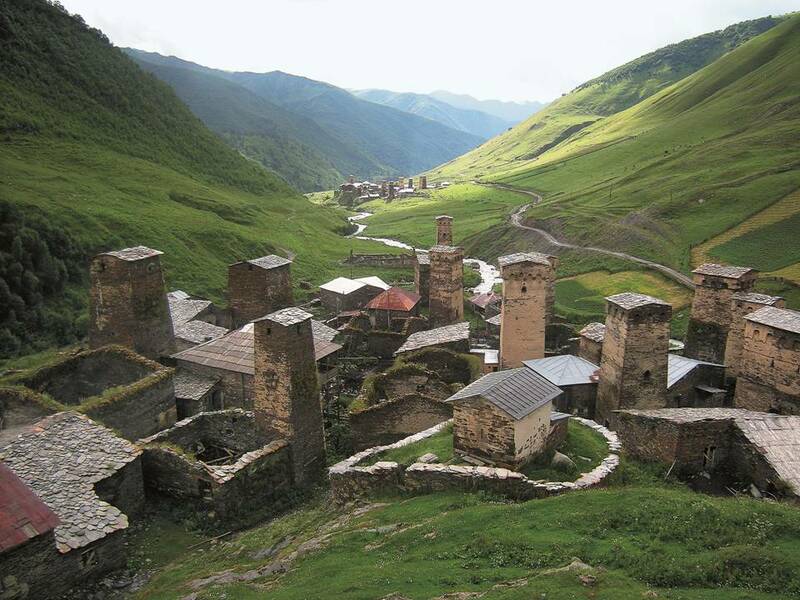 This post about Svaneti is awesome! Very interesting. I am glad they we able to preserve some of those towers. Georgia is doing a lot to preserve its heritage. There are a number of on-going conservation projects, some of which we have featured in this blog. They have stood the test of time extremely well. 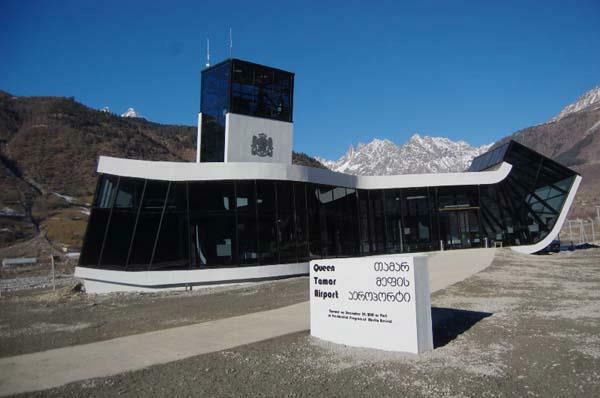 This are has harsh winters and these towers had to withstand inclement weather and avalanches. 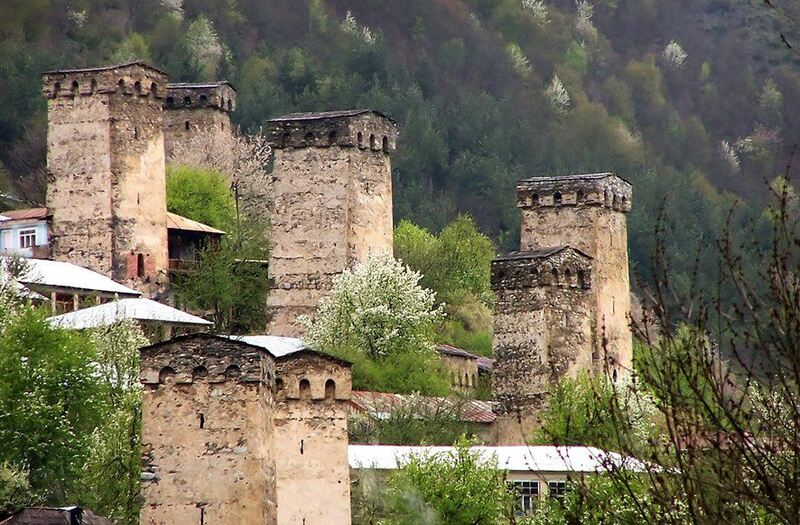 The tower and the town of Svaneti are amazingly enigmatic! We feel long time history even from the pictures above. It was also very interesting to hear that the entrance to a tower is not on the ground, with a ladder or staircase below for protection. They were dangerous times Kevin and fortified houses and towers were a necessity. Wow, how did I miss this post. I’ve always found the Svan towers fascinating but I never knew about the interiors. Great post and photos!!!!!! I would love to get a winter hat from Georgia. Who could I contact?